In any version of roulette, all you're doing is guessing where the ball is going to land. All betting is done against the dealer, who controls winnings, the wheel and the ball. Note that there are two different types of wheels. European roulette wheels have a 0 and 36 numbers, while American ones have both a 0 and a 00 slot. Check out the variations of Roulette to learn more. Up to 8 people can play against the dealer. Everyone gets chips of a certain color to represent his/her bet so that there's no confusion as to whose bet is whose. Of course, in the case of online roulette, there's only one player and therefore only one chip color. All bets go down on the roulette table. 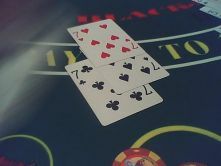 Players are permitted to bet on one to four, six, or twelve numbers, whether a number hit will be even or odd, whether it will be black or red, or the size of the number- whether it will range from 1-18 (small) or 19-36 (large). The dealer gets to decide when betting is finished, and then s/he spins the wheel and rolls the ball. Then, once the ball lands, s/he tells the players what the winning numbers are and pays them their dues. Any losing bets are collected by the house. Roulette is just a simple prediction game. There are no complex rules to it. Roulette rules include names for different types of bets, depending on what you bet on, and they fall under two categories- inside and outside. If you want to play roulette, all you have to do is learn some simple roulette rules and srategies. The French names for the different bets aren't even hard. Enjoy the game. Or you can also check out baccarat for any luck.